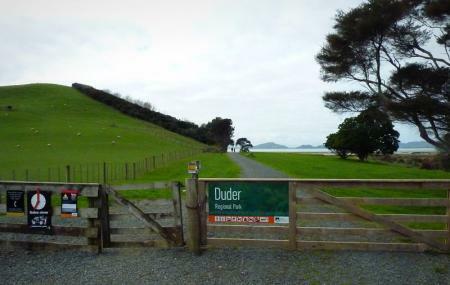 Situated around 49 kilometres from Auckland, the Duder Regional Park is a park on the Whakakaiwhara Peninsula. The Peninsula has a long and rich history, which begins with the visit of the Tainui canoe in the 1300s. One can go on exploration trails- Farm Loop Walk to see the earthwork remains of fortified Maori settlement and Coastal Walk to enjoy your day fishing and picnicking, Farm Loop Walk and Sustainable Trail. The regional park is also popular with bird watchers. Apart from these, other activities at the park include horse riding, mountain biking, paragliding, orienteering and swimming. The picnic area adjoining the car park is on a flat, grassed area and is wheelchair accessible. Hiring a taxi or renting a car is advisable. How popular is Duder Regional Park? People normally club together Waiheke Island and Auckland Botanic Gardens while planning their visit to Duder Regional Park. Absolutely stunning walk with breathtaking views. Highly recommend. Great for the kids also. Great tracks to follow! Great place for an energetic walk in the crisp autumn sea air. Lovely view at every step. Take water along. Picnic spots around every corner. Easy tracks. Pee before heading into the park. Shoes must be cleaned before entering the park. It's nice that they let you near the farm animals.